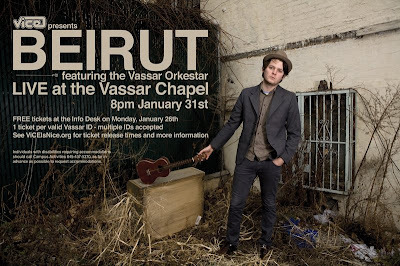 Here is your first look at the poster for ViCE's Beirut concert. FREE tickets* will be available at the InfoDesk at both 10am and 3pm on Monday. Tickets will also be available online on Monday at 3pm. *Must have Vassar ID to get a ticket. 1 ticket per ID. You can use multiple IDs to get tickets for other people.